Market opportunity assessment for maritime data and analytics product. AMR supported a leading global information services provider in its consideration to expand its presence in the maritime B2B information market. The client engaged AMR to assess the global market opportunity of maritime data and analytics products. Typical maritime data analytics products serve vessel owners and operators, port authorities, commodity traders and financial institutions e.g. insurers. AMR investigated the use cases for analytics across user categories in its assessment of the global market opportunity. 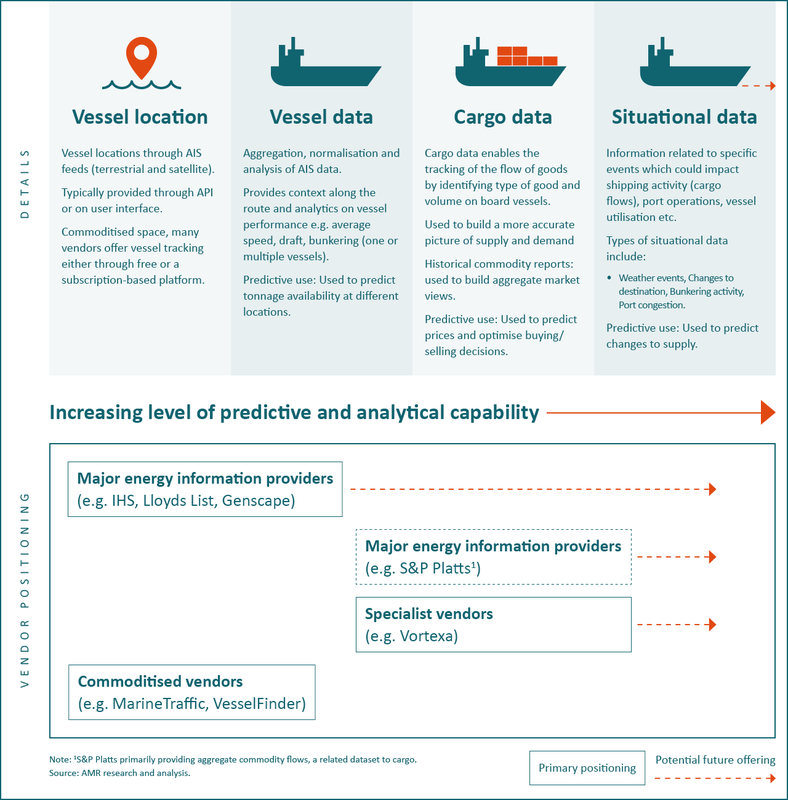 What is the market opportunity for maritime data and analytics products? What are the drivers of adoption? Which user segments are using maritime data? What is the user profile(s) and what are the critical user needs? How are these needs currently being served? What is the current utilisation of maritime data-analytics solutions? Who are the key vendors serving the market? Maritime data and analytics broadly spans four core product segments, situational data is an emerging category. Customers in different industries had varying levels of data “literacy”; targeted solutions with appropriate delivery models and complexity of analysis were identified as success criteria. AMR identified the emergence of alternative data sources and AI based predictive data analytics solutions as a new frontier in maritime information solutions. AMR delivered clear recommendations to the client on its future strategy to pursue investment opportunity in maritime data and analytics including market segments that are attractive, and vendors that are best-placed to ‘win’ share.